The singing, songwriting, storytelling, boogie-woogie piano playing, long tall Marcia Ball makes her way back to Chicago this weekend for two shows—Friday, December 11th at S.P.A.C.E. in Evanston and Saturday, December 12th to play Fitzgerald’s 35th Anniversary Show. 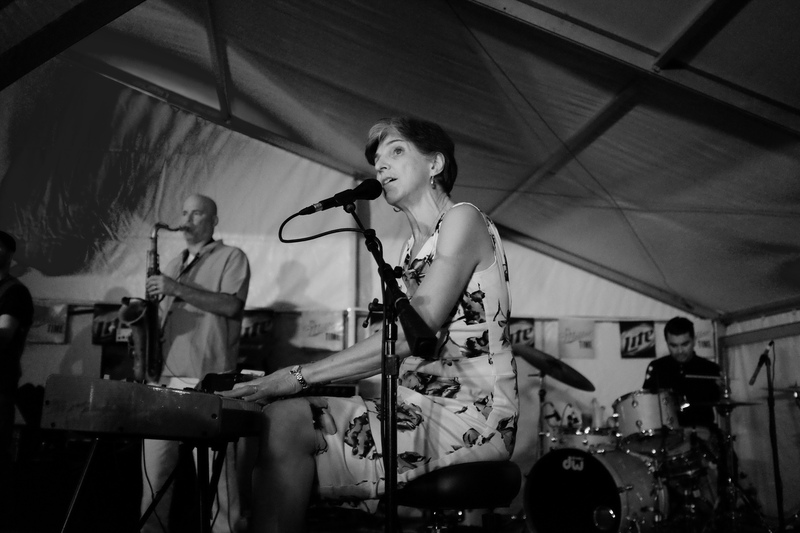 No stranger to Chicago, Marcia Ball has played the city for decades and has been part of Chicago’s Alligator Records since 2001. She continues to tour in support of her most recent release, 2014’s The Tattooed Lady and the Alligator Man. Earlier this year, Blues Scene Magazine awarded Ball the 2015 Pinetop Perkins Piano Player Award. 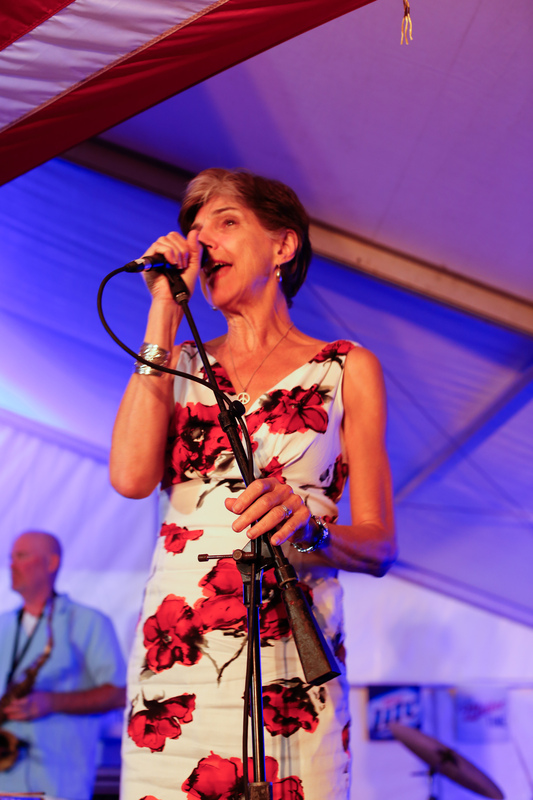 The Chicago Ambassador had a chance to catch up with Marcia Ball back on July 2nd, 2014, shortly before her headlining set on opening night of Fitzgerald’s 33rd American Music Festival. Marcia Balls plays Fitzgerald’s. Photo by Viki Gonia. CA) Before pursuing a career as a musician you studied literature at LSU. Do you feel that your literature background influenced your songwriting? BALL) Well, ultimately it did. I like to tell stories. I began to write more and more songs and that’s what it is—is really short stories. It’s easy compared to real writers who have to fill pages and pages and develop characters. I get these verses and a chorus out—I guess that’s the challenge. CA) Do you have a “go to” process when writing your songs? BALL) It varies. First of all, I have to be under fire–on a deadline to make a record. I have to start thinking like a writer, which means I begin to eavesdrop. I begin to just listen for hooks and situations and interesting phrases. I make notes. I wander around and make notes at any given time and eventually I go sit down at the piano. Sometimes the whole process may take place behind the wheel of a car or in the front seat of a car. I get an idea–a line–and it grows. Now in the day of cell phones with recording capacity, I sing into my cell phone when I come up with an idea or a line or type a note. It varies. Eventually though it has to all go to the piano. That’s where I have to put it together. CA) Place is so important in literature and in song. How has being from Louisiana influenced your writing? BALL) Well, Heavily. Being from Louisiana has influenced my writing but the one challenge of the whole thing is trying to not be so provincial about it–to write a song that tells a story that has a sense of place but doesn’t seem corny. It doesn’t have too small of a focus. It has to be universal enough — working more on that direction. In my case after writing a lot in the 10 or 15 records I’ve got–you get to a point—I’ve said a lot about food, momma and daddy, home and everything else. The challenge is finding something to write about. The new record I’m working on–I don’t think I say Louisiana once in it. CA) How has it influenced your piano playing? BALL) That is undeniable. It started with my grandmother who was a Ragtime piano player and my aunt who was a wonderful player of popular music on the 40s and 50s. And of course I grew up in the heyday of Fats Domino, Little Richard, Jerry Lee Lewis and Ray Charles, so all of that was in the air—-that’s how it started. As I started playing piano in bands and eventually started my own band centered on the piano and writing about that I dug deeper and deeper into New Orleans music. I’ve always loved the songs of Allen Touissaint. I just loved how Irma Thomas played and Ernie Kato and all those great songs. Lloyd Price and “Working in a Coal Mine”–Lee Dorsey. I still compare my songs when I’m writing them–I think “Hmmmm. Is this up to par or even approaching par?” Then of course you dig around New Orleans and there’s James Booker, Professor Longhair, Archiebald, Eddie Bo—names people don’t really know. BALL) Well, that’s mainly the thing we’ve been doing the last few months. Writing, rehearsing, recording and refining. It’s called The Tattooed Lady and Alligator Man—so just imagine the graphics! It’s a story song–it’s in the can. It comes out in September. CA) What new music has caught your ear? BALL) Austin, where I live, is a great place. It’s a crucible for young and interesting new musicians. The band who played before Junior [Brown]—the Warren Hood Band—all these young people. The youngsters coming up are wonderful. Emily Gimble. Caroline Wonderland. Shelly King. Ruthie Foster—are awesome. Amy Helm who also sings on my new record. There’s just so much great new music. CA) Do you have a favorite Chicago recollection or anecdote? CA) What does is say that they’ve chosen you to headline The American Music Festival? BALL) Well, it’s an honor. In fact the one year I wasn’t supposed to play I actually snuck in and played anyway–unbilled. It’s just the best club in America. It’s a big festival in a small place. These are my friends–like family. This is home.